1948 նոյեմբերին, Բեգինը ընտրական քարոզարշավով այցելեց ԱՄՆ։ Նրա այցի ընթացքում Ալբերտ Այնշտայնը, Սիդնեյ Հուկը, Հանա Արենդտը և այլ հայտնի ամերիկացիներ և մի քանի ռաբիներ նամակ հրապարակեցին, որում Բեգինի Հերութ կուսակցությունը նկարագրվում էր որպես "ահաբեկչական աջակողմյան շովինիստական կազմակմակերպություն Պաղեստինում"
↑ 1,0 1,1 חה"כ מנחם בגין — Knesset. ↑ 6,0 6,1 6,2 German National Library, Berlin State Library, Bavarian State Library et al. Record #118508296 // Gemeinsame Normdatei — 2012—2016. ↑ John J. Mearsheimer and Stephen M. Walt, The Israel Lobby and U.S. Foreign Policy, at 102 (Farrar, Straus and Giroux 2007). ↑ Gwertzman, Bernard. Christian Militiamen Accused of a Massacre in Beirut Camps; U.S. Says the Toll is at Least 300. The New York Times. 19 September 1982. ↑ Thompson, Ian. Primo Levi: A Life. 2004, page 436. Eitan Haber (1979). 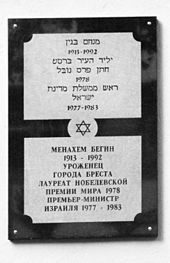 Menachem Begin: The Legend and the Man. Dell Publishing Company. p. 136. 978-0-440-16107-3. 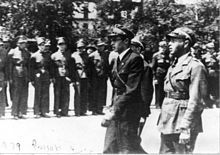 "A while later Anders's Chief of Staff, General Ukolitzky, did agree to the release of six Jewish soldiers to go to the United States on a campaign to get the Jewish community to help the remnants of European Jewry. The Chief of Staff, who was well acquainted with Dr. Kahan, invited him to his office for a drink. There were a number of senior officers present, and Kahan realized that this was a farewell party for Ukolitzky. 'I'm leaving here on a mission, and my colleagues are throwing a party but the last document I signed was an approval of release for Menahem Begin.'" Bernard Reich (1990) Political Leaders of the Contemporary Middle East and North Africa Greenwood Publishing Group. 978-0-313-26213-5. p. 72. "In 1942 he arrived in Palestine as a soldier in General Anders's (Polish) army. Begin was discharged from the army in December 1943." Harry Hurwitz (2004). Begin: His Life, Words and Deeds. Gefen Publishing House. 978-965-229-324-4. p. 9. "His friends urged him to desert the Anders Army, but he refused to do any such dishonourable thing and waited until, as a result of negotiations, he was discharged and permitted to enter Eretz Israel, then under British mandatory rule". "Biography – White Nights". Menachem Begin Heritage Center. Retrieved 16 January 2012. "Many of the new recruits deserted the army upon their arrival, but Begin decidedly refused to follow suit. 'I swore allegiance to the Polish army – I will not desert,' he resolutely told his friends when he was reunited with them on Jewish soil. Begin served in the Polish army for about a year and a half with the rank of corporal... At the initiative of Aryeh Ben-Eliezer and with the help of Mark Kahan, negotiations began with the Polish army regarding the release of five Jewish soldiers from the army, including Begin, in return for which the members of the IZL delegation would lobby in Washington for the Polish forces. The negotiations lasted many weeks until they finally met with success: The Polish commander announced the release of four of the soldiers. Fortunately, Begin was among them." Amos Perlmutter (1987). The Life and Times of Menachem Begin Doubleday. 978-0-385-18926-2. p. 134. "In the Ben Eliezer-Mark Kahan version, Begin received a complete, honorable release from the Anders Army. 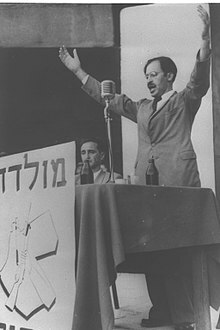 The truth is that he only received a one-year leave of absence, a kind of extended furlough, in order to enable him to join an Anders Army Jewish delegation which would go to the United States seeking help for the Polish government-in-exile. The delegation never materialized, mainly due to British opposition. Begin, however, never received an order to return to the ranks of the Army." Stefan Korboński (2000). "ROZDZIAŁ IV: ŻYDZI W CZASIE OKUPACJI". "Kapral Menachem Begin podejmując decyzję, czy zostać czy walczyć z faszystami, stwierdził: "Armia, której mundur noszę i której składałem przysięgę wojskową, walczy ze śmiertelnym wrogiem narodu żydowskiego, faszystowskimi Niemcami. Nie można opuścić takiej armii, nawet po to, aby walczyć o wolność we własnym kraju... Na prośbę Irgunu Drymmer zwrócił się do Generała Tokarzewskiego z sugestią, aby zwolnił Menachema Begina za aktywną służbę, ponieważ jest on potrzebny organizacjom żydowskim. Jako były przywódca Podziemia w pełni rozumiał on co się dzieje, a ponieważ sprzyjał celom, do których osiągnięcia dążyło żydowska konspiracja, generał dał Beginowi urlop na czas nieokreślony." ↑ Yehuda Bauer, From Diplomacy to Resistance: A history of Jewish Palestine, Jewish Publication Society of America, Philadelphia, 1970 p.325. ↑ In his book ‘The Revolt’ (1951), Begin outlines the history of the Irgun’s fight against British rule. ↑ Begin's Speech on Saturday 15 May 1948 Archived 29 September 2013 at the Wayback Machine. ↑ Silver, Eric (1984) Begin: A Biography. Weidenfeld and Nicolson, 0-297-78399-8. Page 107. ↑ Morris, 1948, p272: "Altogether eighteen men died in the clashes, most of them IZL". 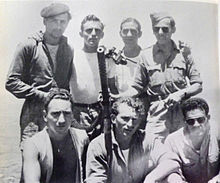 Katz, Days of Fire (an Irgun memoir), p247: 16 Irgun, 2 Hagana. Perliger, Jewish Terrorism in Israel, p27: 16 Irgun and 2 Hagana. ↑ Koestler, Arthur (First published 1949) Promise and Fulfilment – Palestine 1917–1949 0-333-35152-5. Page 249 : "About forty people had been killed in the fighting on the beaches, on board the ship, or while trying to swim ashore." ↑ Netanyahu, Benjamin (1993) A Place among the Nations – Israel and the World. British Library catalogue number 0593 034465. Page 444. "eighty-two members of the Irgun were killed." ↑ "The Gun and the Olive Branch" p 472-473, David Hirst, quotes Lilienthal, Alfred M., The Zionist Connection, What Price Peace?, Dodd, Mead and Company, New York, 1978, pp.350–3 – Albert Einstein joined other distinguished citizens in chiding these `Americans of national repute' for honoring a man whose party was `closely akin in its organization, methods, political philosophy and social appeal to the Nazi and Fascist parties'. See text at Harvard.edu and image here . Verified 5 December 2007. ↑ Einstein had already publicly denounced the Revisionist Zionism|Revisionists in 1939; at the same time Rabbi Stephen Wise denounced the movement as, "Fascism in Yiddish or Hebrew." See Rosen, Robert N., Saving the Jews: Franklin D. Roosevelt and the Holocaust, Thunder's Mouth Press, New York, 2006, p. 318. But he quit in 1970 when Prime Minister Golda Meir, under pressure from Washington, renewed a cease-fire with Egypt along the Suez Canal. ↑ Policy Implementation of Social Welfare in the 1980s By Frederick A. Lazin. Google Books. ↑ Public Policy in Israel By David Nachmias and Gila Menachem. Google Books. Триумф и трагедия Менахема Бегина Ссылка проверена 25.12.2006.